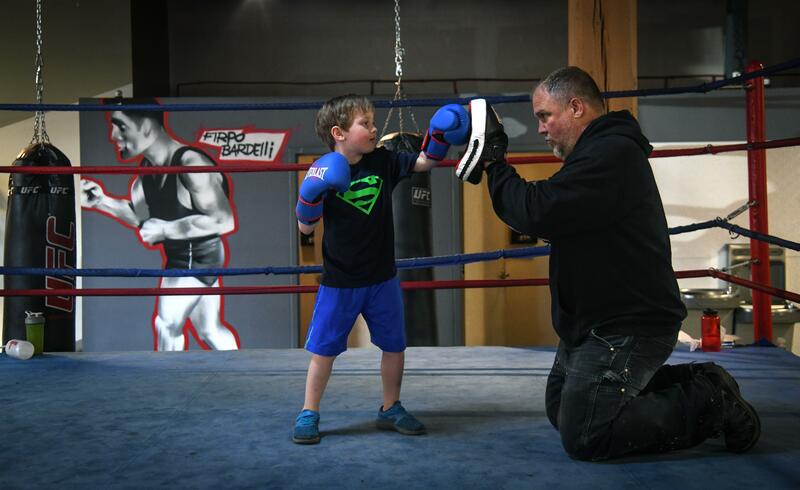 Rick Welliver paced around the ropes and punching bags of his downtown Spokane Boxing Gym last week, barking out orders to a wide-ranging group of fighters. Some were there to get in shape and learn a method of self-defense. Others were sparring because of their genuine love for the sport, hoping to earn a taste of the success Welliver enjoyed 20 years ago. Welliver, a formerly rough-and-tumble Hillyard native, worked his way up the local boxing rungs before throwing jabs in more than a dozen professional light-heavyweight bouts. Fifteen years removed from his last fight, Welliver, 46, has been passing on his bountiful in-the-ring knowledge in stern and intense fashion. Dogging it between stations? Expect a scolding. Exhibit a hint of attitude? He’ll point you to the door. But underneath his tough exterior, Welliver is affable and compassionate. It’s a big reason that some of his most hardened, tough-luck pupils stick around and endure his tongue-lashings. Even his more grounded, well-adjusted fighters know what Welliver is truly about: their growth outside the ring. “Can you write a letter of recommendation for me? I’m applying for a scholarship,” a teenage girl asked Welliver at the conclusion of her workout Tuesday. “Yes, just let me know when you need it,” Welliver replied. A few minutes later, Welliver, the gym and club’s owner, looked on as a young boy threw his first punches into the hands of a trainer. Many of his club’s young members come from troubled homes, where parental guidance and support are often nonexistent. When a young adult male asked Welliver if he could stay at the gym a little later than closing time, he lit up with an ear-to-ear smile when Welliver nodded. Welliver has provided an outlet to help many of his current and former members get their lives on the straight and narrow, often waiving their membership fees so they’d keep returning. Not all of them stayed the course, though, and had their share of run-ins with local law enforcement. Welliver and the Spokane Police Department recently teamed up in an attempt to get ahead of the issue. SPD has operated a six-week PAL program for at-risk youth during the summer where officers offer coaching and mentorship in a variety of team sports, but never a year-round program, according to Sgt. Michael Carr of the SPD Outreach Program. Boxing will be the city’s first year-round PAL program. A few Spokane officers with boxing backgrounds are expected to participate. The program will start as soon as possible, according to Welliver and Carr. Tournaments and regional competition have often spawned from the PAL program in other cities and are sanctioned by USA Boxing, something Welliver hopes to emulate. “Boxing introduces kids to failure and how to respond to failure,” Carr said. “And when they come to PAL, there will be expectations for them. “This will also help soften the image of law enforcement in the eyes of these kids,” Welliver said. PAL’s alumni list includes former professional boxer Calvin Brock; Anthony Morrow, a shooting guard who played for seven NBA teams; and current Miami Dolphins defensive back Walt Aikens. PAL boxing programs have been in cities across the country, and Welliver said he’s been trying for more than a decade to get SPD involved. SPD Chief Craig Meidl was the first chief to show any interest, Welliver said. “He’s a chief who thinks outside the box,” he said. Welliver’s late father, Rick Welliver Sr., introduced his son to PAL, referencing chapters from Tacoma to Miami. Published: March 25, 2019, 5 a.m.